Backpacking Philippines: The NPA in Gubat, Sorsogon? The NPA in Gubat, Sorsogon? 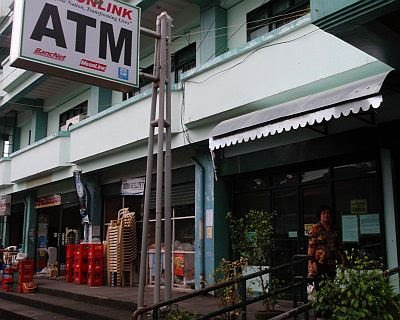 Two days before Tutubi went to Sorsogon, news on TV bannered a story about an encounter with the NPA in the town of Gubat, Sorsogon that worried his friends who knew where he's going next. But the ever undaunted Tutubi, actually aware, was not afraid for he knew that the trouble really lies in the remote barrio of the town whose name means jungle in the vernacular. When he got to Gubat, he immediately noticed the presence of large banners welcoming Jejomar Binay, the present mayor of Makati City now eyeing the country's most powerful seat, with a speaking engagement at Rizal Beach Resort. Gubat is actually a peaceful and progressive town in Gubat Bay with rizal beach becoming a haven of newbie surfing and skimboarding. There are various beach resorts in Gubat including Rizal beach Resort and Vermaris Resort. Note: Media really needs to avoid sensationalism in breaking the news, the network gets the attention but the community is really badly affected as well as the entire country. No matter how beautiful the country is, misinformed tourists won't come and visit the place. You want a second opinion about Sorsogon and the friendly NPAs of Bicol as well as safety and security of foreigners and toursits there? Ask Sidney, the Belgian owner of My Sari-Sari Store who calls Sorsogon his second home and actually stayed there for twenty long years with no problems with the NPA. i was so scared for those people on top of those tricycles. must be a scary ride but it didnt look like they were scared at all! media sometimes has its way of bloating up stories. the non-sensational becomes sensational at times. good for those promoting their agendas and gimmicks but not for those who want fair and honest journalistic news. one of the reasons why i don't believe everything i read in the papers or heard on TV and radio, is the tendency of media to exaggerate. but more often than not, even when the story is untrue, a tourist or an investor would possibly stay away. Bicol is alas infested with NPA rebels and clashes between the police, the military and the NPA are happening quite frequently. Like the mafia in Italy the NPA is collecting revolutionary taxes from local businesses, bus and telecom companies. I never came out with this coverage since I was not sure if I was “officially” allowed to make pictures inside this army base. I didn’t want to embarrass the army captain who was in charge of the camp. But since he is already dead I might as well honour him in the future. That being said... the NPA will not harass tourists, visitors or foreigners. It is only dangerous for police and military personnel. news are sometimes exaggerated or sometimes it talks about a small town but when reported is like it happens on the whole province. it is a must for travelers like us to heed caution whenever we go to unfamiliar territory. for most areas in luzon, the media hyped NPAs as a threat, but you are correct in saying that they are really in far-flung area (mostly mountainous) that if you stay in the city/municipality proper, then you are safe. but since we like to explore the wilds, an encounter with them might be possible, but if they are similar to the NPA's of my province (Nueva Ecija), then you will have no problem because they are not after tourists but after businesses in the area for revolutionary taxes. the place looks similar in other province in philippines. it also like a nice place. tsk, tsk are the NPA back ? This really affects tourism whether we like it or not. People just don't feel safe when they hear this news. You know what's more dangerous than NPAs? NPAs disguising as military personnel or unidentified armed private guards. It's been an old tactic of the insurgents to confuse civilians. The unfortunate thing about this is the press and media take the situation on surface value and the goal of divisiveness is easily disseminated nationwide. What you get over time is a house divided unto itself -- exactly what communists want for the Philippines. I am from Gubat. My mother was born and grew up there. I go there about 4-5x a year for a week or 2. Don't believe everything you hear or read. Yes, there are NPAs. They are all around and mix with the populace. But they don't bother civilians or tourists. We just don't wear military or camoflaged clothings to avoid being mistaken for one. Basically, you can travel safely all over the place, especially if you have your own vehicle or motorcycle, which is the best to get around without spending a lot for gas. The roads are basically good and you can get around pretty quickly even if the towns are 15-25km away. 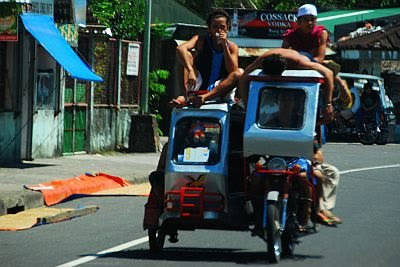 For example, from Gubat to Sorsogon City is just 25-30min away w/c is 21km apart, even with public jeep. Gubat to Bulusan is about 40-45min and that is about 29km way. The only problem if you take public transport is that the last trip in some times can come in early (as early as 3pm), so you have to plan your trip if you don't have your own vehicle. Otherwise, you will pay a lot for special trip back or you may have to spend overnight where you are. Always consult the locality. Rizal Beach is overrated. In fact, that area is not as good as it was 15 years ago. The beachfront has receded greatly in the past years, so basically, there's not much beach front especially during high tide. Same with Villa Maris which occupies the same beach area. If you want better beaches go further to Bulusan. There's better pick there (e.g. Dancalan Beach in Bulusan area). For me, it's not the beaches that is the best in Gubat or nearby areas. It's the old churches and the small bodies of water and rivers. If you can go to those, then it's a treat you will like. Bulusan Lake, Masacrot, Bayugin Falls, and other sites are often not mentioned but they are more awe inspiring than the beaches. 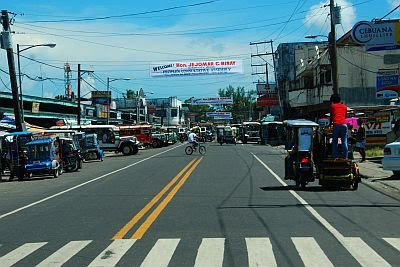 Some are outside Gubat or its periphery towns like Prieto Diaz. Cost of food is not like 5 or more years ago, where it was still cheap. As the town/province progressess, the cost of food and other items are going up. Even sea foods aren't that low priced anymore like it used to. But for sure, if you like sea foods, the ones in the market is usually freshly caught in the morning. I even go to Dancalan beach (in Gubat) and in the pm, some boats coming back can have really fresh catches. If you want, you can get a fishing pole and fish yourself! Now, that's a real treat! Oh, if you go to the Gubat public market, just be careful of some pick-pockets. They usually work during the tiangge day (Fridays). I've personally seen some husband-wife team at work in the public market. This is not often, but it these people do come and go. Best time to go to Sorsogon is in late April-July/August. It usually rains a lot in November-Feb/March. But with Global warming, it's really hard to predict the weather now. But usually, the months I listed are accurate. For Gubat, the feast of St. Anthony is the 13th of June. But celebrations begin by the 12th lasting to up to the 15th or so. The men folk of Gubat love to drink. So, there's a lot of drinking going on the feast days, aside from the procession, parades, programs, games, etc.